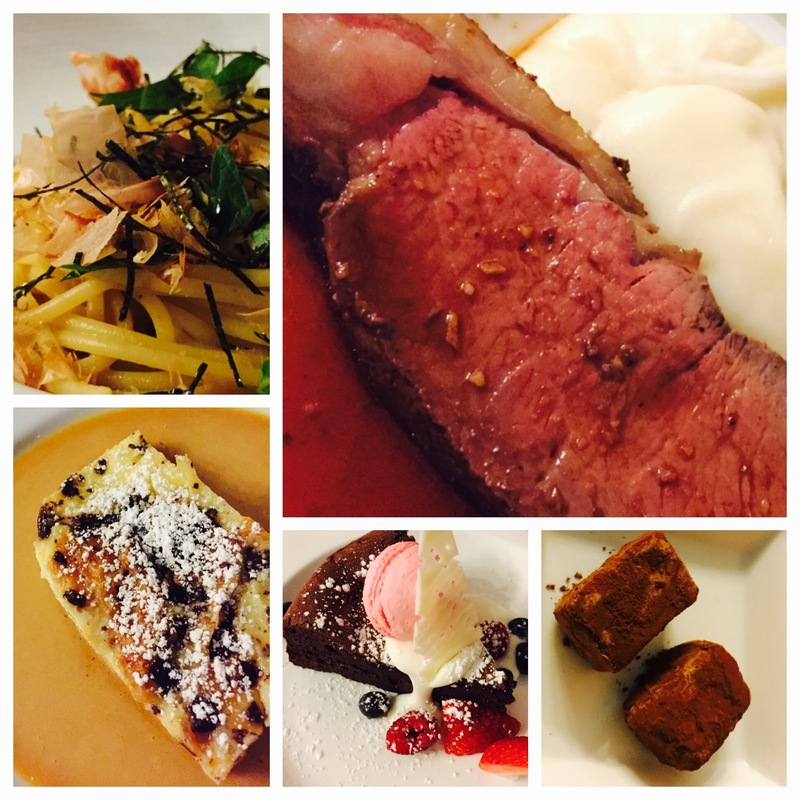 Cafe Hiro's prix fixe Christmas Eve Dinner is a holiday tradition we intend to continue for as long as Cafe Hiro offers it. I first waxed poetic about seven years ago. Last year, when I wrote about it, I merely put up my snapshots to let the pictures speak for themselves. This year, I'm going to implore you to remember this post come next Christmas Eve and make a reservation, because last night, despite the bargain base price for a meal of this magnitude, there was barely anyone there to enjoy it. 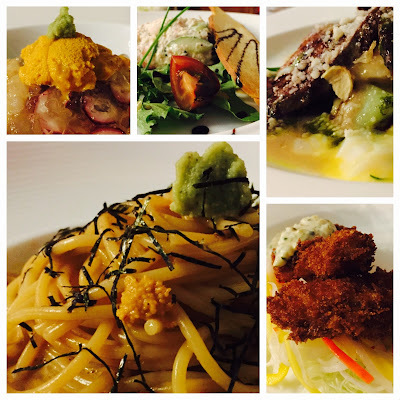 If you did you would've been dazzled by Chef Hiro Ohiwa's food and pampered by his attentive staff. You would've started your five-course feast with the sashimi plate of Fanny Bay oysters, sea urchin, scallop and octopus that he mixes with dashi gelee, yuzu-vinaigrete and white truffle oil. Your date would've swooned over her first course, too: a creamy spread of smoked salmon, shrimp, crab meat and cream cheese eaten with red onion, caper and cherry tomatoes over crispy toast. Your second course would've been thin slices of beef tataki with poached cabbage, anchovy-vinaigrette, reggiano cheese, garlic chips, all drizzled with a balsamic reduction. She would've said her course--the breaded monkfish with tartar sauce over an Asian mango slaw--tasted like the best fish sticks crossed with a lobster she'd ever had. Next, you both would've tried not to fill up on the uni spaghetti, a Cafe Hiro classic, or the ume-shiso spaghetti with oba mint and nori, with dried bonito flakes that flap in the hot updraft as though they were still alive. And for a main course, you both would've opted for the hunk of roasted beef--yours cooked to a rosy pink, hers well-done--both soft as silk and doused with garlic soy sauce, served with Chef Ohiwa's ultra creamy mashed potatoes. Finally, for dessert, you would've been able to choose from the regular menu of sweets, but then you would've also noticed a gateau au chocolate with macaron, fresh berries and whipped cream that Ohiwa added just for Christmas Eve. You would've ordered it but also the croissant bread pudding, because that's what you did last year, and tradition is tradition. 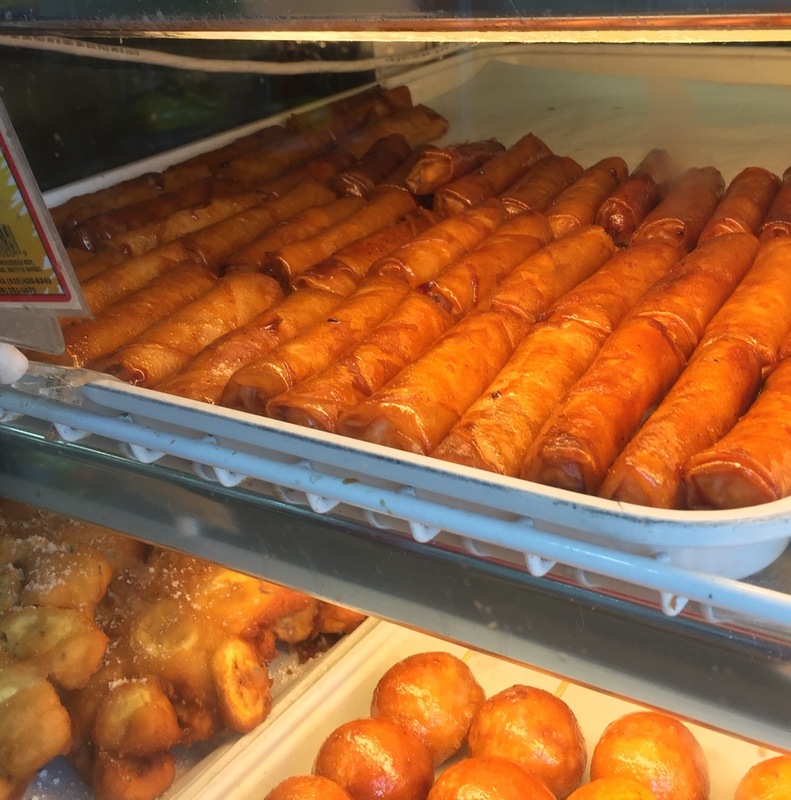 No, those aren't egg rolls; they're turon. What's a turon? Well, it's an egg roll. Filled with banana. And sometimes jackfruit. But for sure, banana. I have an unresearched and yet unproven theory that all equatorial countries in Asia have a version of a fried banana dessert. This one is the Philippines'. And as I've said in a previous post about the subject, Valerio's does a very good version--even accounting for variations between branches. I've had the turon at the Valerio's inside Seafood City in Irvine on many occasions. Though the banana inside can vary in sweetness, one thing about it is constant: its crunch. And it's not just because it's deep fried like all egg rolls; it's because it's also covered in a glassy cocoon of caramelized sugar not unlike on a creme brulee. It's this finishing touch that hermetically seals the egg roll as though it was locked in amber, preserving the texture and ensuring that the crunch from every bite will rattle your bones. And if you come to Valerio's near closing time, the cashier might just give you a few extra for free. Normally, they're 50-cents a piece. Filipinos might recognize the dish Grill City offers at its steam tables as lumpiang hubad. For the non-pinoys who might wander in, Grill City has named it "Naked Salad", which is kind of like calling a burger "chopped steak"--true, but not always accurate. Lumpiang hubad, or, in this case, "Naked Salad", is actually the unwrapped version of lumpiang sariwa, which, if you've ever attended a catered Filipino party, are the things your host might call "fresh spring rolls"--delicate burritos filled with veggies swaddled inside an unfried egg roll wrapper. They're usually eaten with lettuce and doused in a sweet and punchy garlic sauce. The contents are simple: lots of chopped cabbage, carrots, green beans, garbanzos and tofu, all of it cooked together just until the vegetables are crisp-tender. 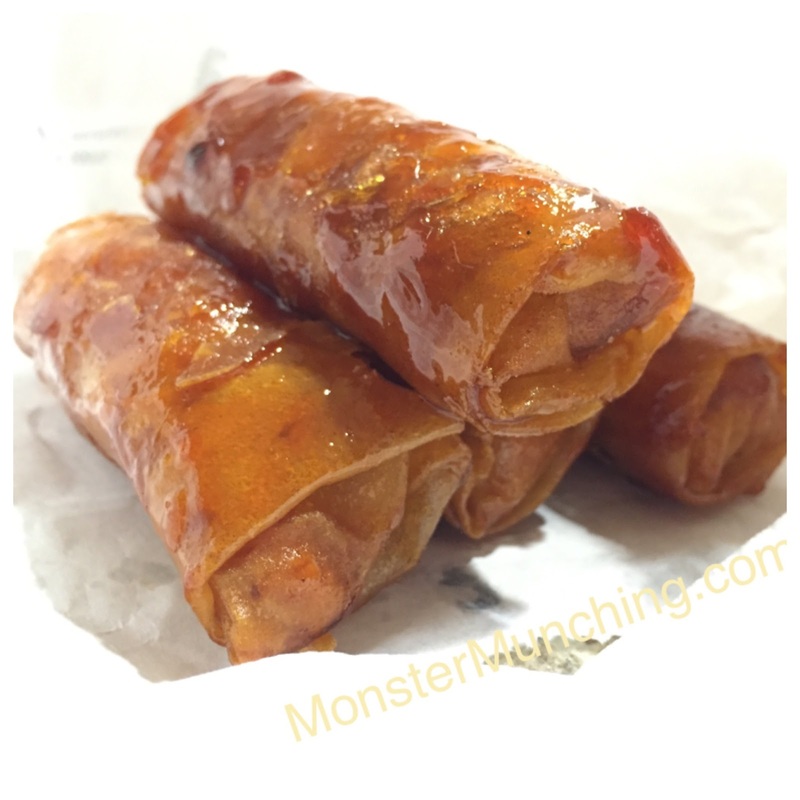 Grill City offers its version of lumpiang hubad as a turo-turo and packs the sauce (which tastes like a garlic-enhanced sweet and sour sauce) in a separate container. Whatever it's called, Grill City's is a bargain because for about $3.50, the guy behind the counter will pile on enough in that container for two meals. I use it as a quick veggie side dish to whatever I've got leftover at home. It even goes well with a fried egg and some rice--the quickest way to a nutritious dinner that includes a salad that's not exactly a salad. Everyone has their own way of customizing their In-N-Out order. Hamburger. Animal Style. Extra Toast. Whole Grilled Onion. Fries Well-Done. "Animal Style" because that's essentially adding extra flavor with mustard, chopped grilled onion, and pickles. "Extra Toast" because the best part of an In-N-Out burger is the texture contrast between the crunchy lettuce, the steamy soft meat, and the crispy griddle-toasted bun--and you can't ask them to make the lettuce extra crunchy. "Whole Grilled Onion" because raw is too strong. And "Fries Well-Done" because without the extra few minutes of frying, In-N-Out's fries are floppy and prone to sogginess. How do you like your In-N-Out?